Questoverseas: £10 million for a dead shark in a tank?! 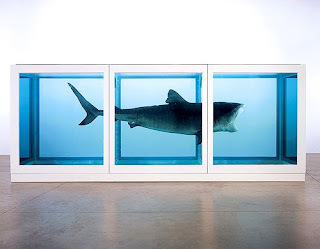 Modern artist Damien Hirst is surely going to be celebrating this week, after selling about 50 of his pieces at Sothebys for a total of £70million, including his famous "Kingdom" piece - a dead tiger shark preserved in a tank of formaldehyde. The question I have is where would you want to display this in the house?! A bit much for the lounge, a bit disturbing for the kitchen. It might work in the bathroom I guess, at least people wouldn't linger too long in the bath...!